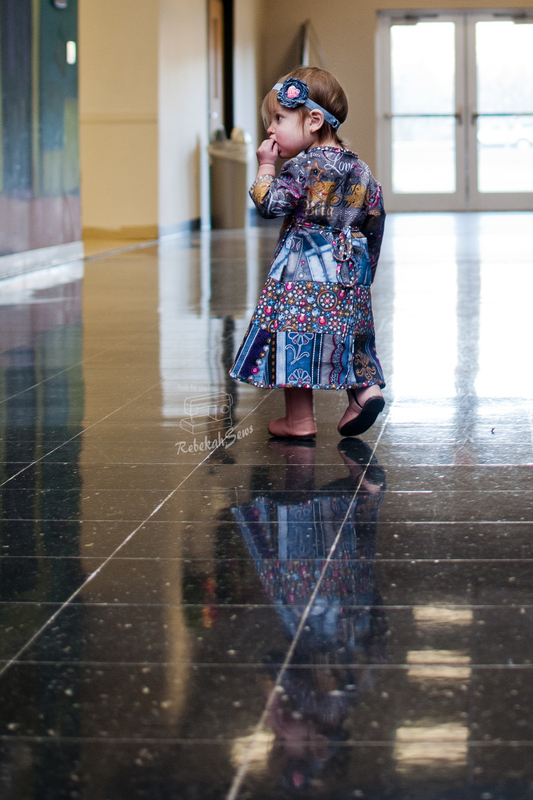 Classic Elegance with Sewing Mama Raeanna and the Bumblebee Dress! Classic. Elegant. When you read that, what do you think of? Well after you see today’s pattern you will always associate those two words with it! I know I do! This dress we are looking at today is one I have been eyeing for a very long time but didn’t make until now. Guess I have been too busy testing patterns that I neglected all the great patterns in my stash. I am sure from the photos you have already seen that you know the designer! 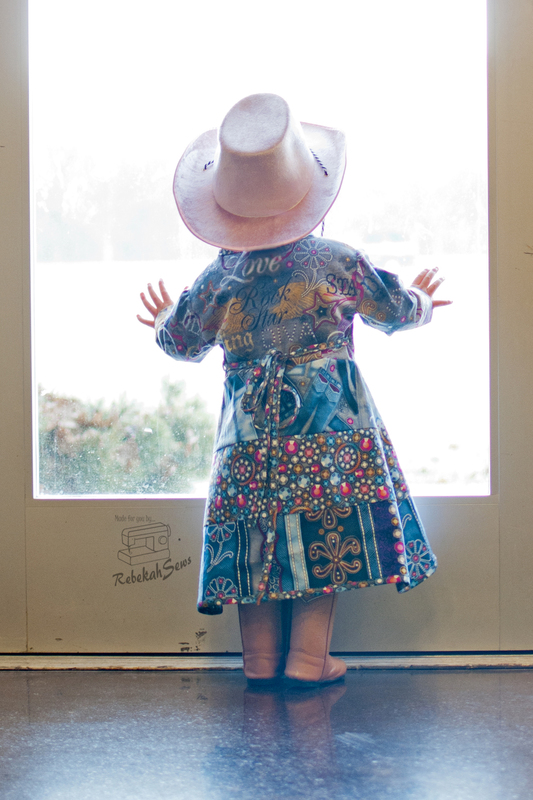 Yes, we are looking at the Bumblebee Dress by Sewing Mama Raeanna today! The Bumblebee dress is such a sweet dress and I now wish I had made it sooner. 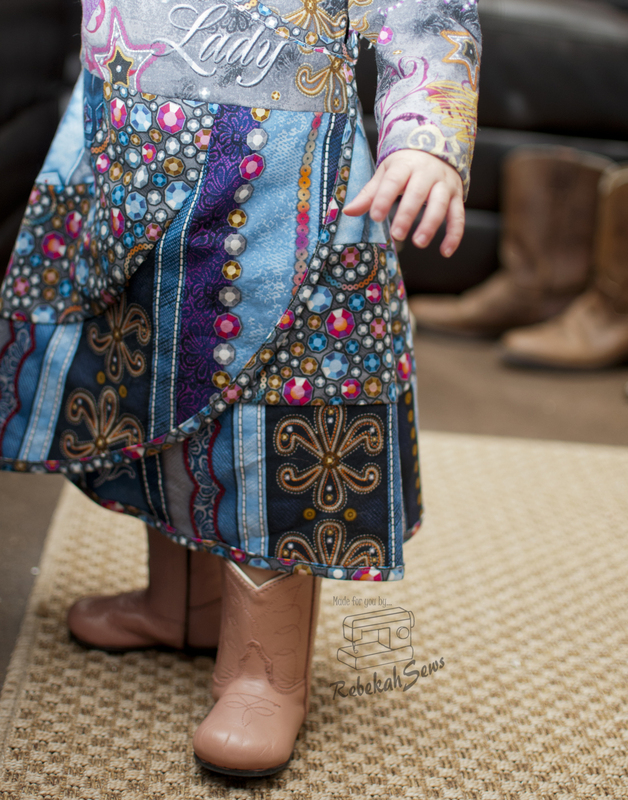 This comes in sizes 3m-12 so it will be perfect for any girl little or big. It features two looks in one pattern. You can make a dress with a ruffle bodice and 3/4 sleeves with ruffles or make a sleeveless dress with a ruffle neckline! Mix and match these options, along with a ruffle hemline for different looks each time. The bodice is perfect for embroidery and the back closes with a button. Make a version for the cooler months or the warmer months. 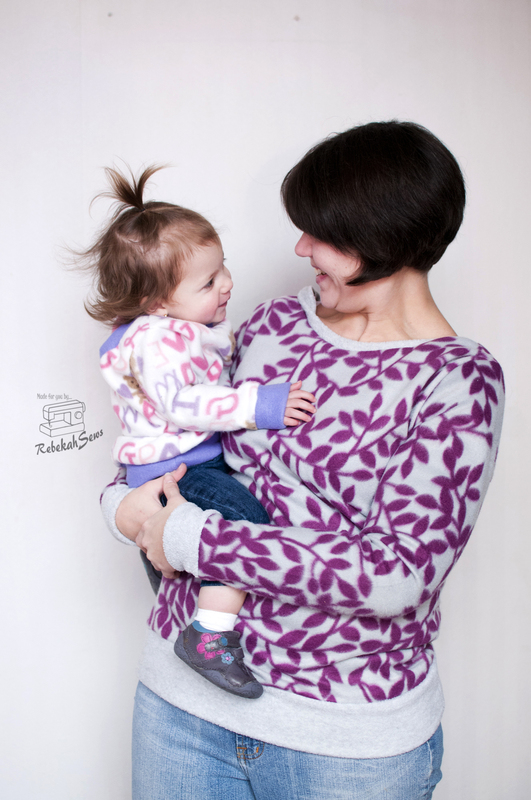 Either way this pattern has you covered and it’s perfect for a beginner too! Before I tell you a little about the dress I made, let me tell you about how I came about the choices I made for the dress. I fell in love with this paper doll fabric from Trixie’s Fabrics. There is a boy version and a girl version. I couldn’t choose which I loved more! So I combined both into this dress. I love the cohesive contrast that it gives. Let me just say that I love the gems I find from Trixie’s Fabrics. 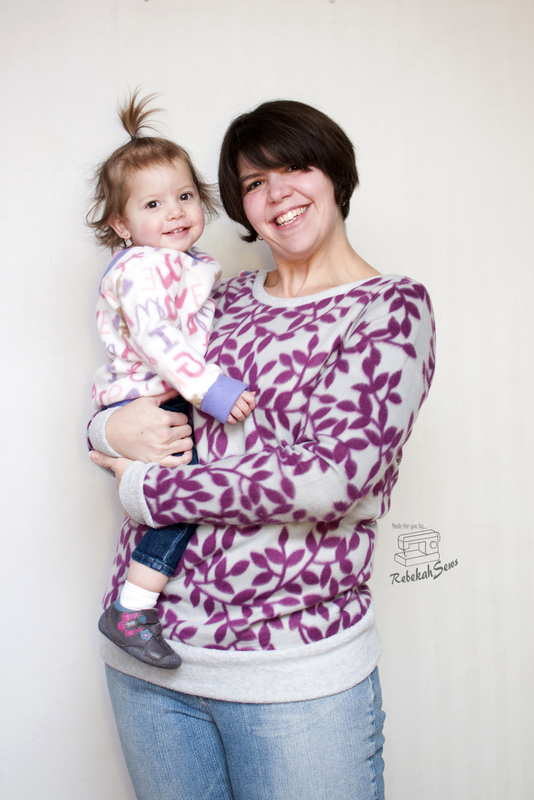 Whether its knits or wovens, she is sure to have something I love. Add the fact that she has great customer service; well I’m a customer for life! I think my wallet may have just cringed with that confession! Now on to my dress. 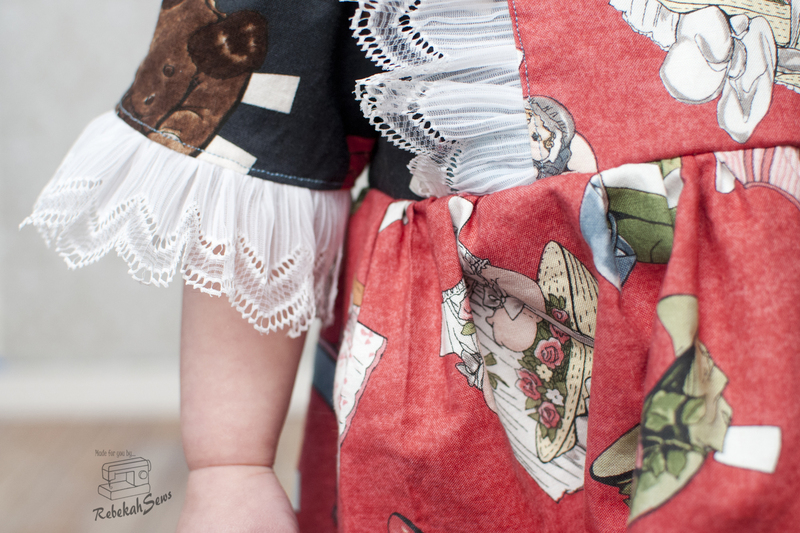 With my vintage looking paper doll fabric I knew I needed a little something more than just woven ruffles. Lace. If you know me, you know I love lace. The lace on the bodice ruffles and sleeves just gave it that look I was going for. Classic. Elegant. I am completely in love with this dress. As you can see, this one is a bit big on my girl. I went back and forth on the size to make. Her chest put her in the 6m size but she wears 12mo in RTW. Thinking I know best and not the measurements I made a straight 12mo size. Yup, it’s big. Note to self…always go by the measurements!! Some days I think I know it all, even when I know better than that. Well, on the plus side, we can enjoy this beauty for that much longer! Ready to sew up some for all the girls in your life? 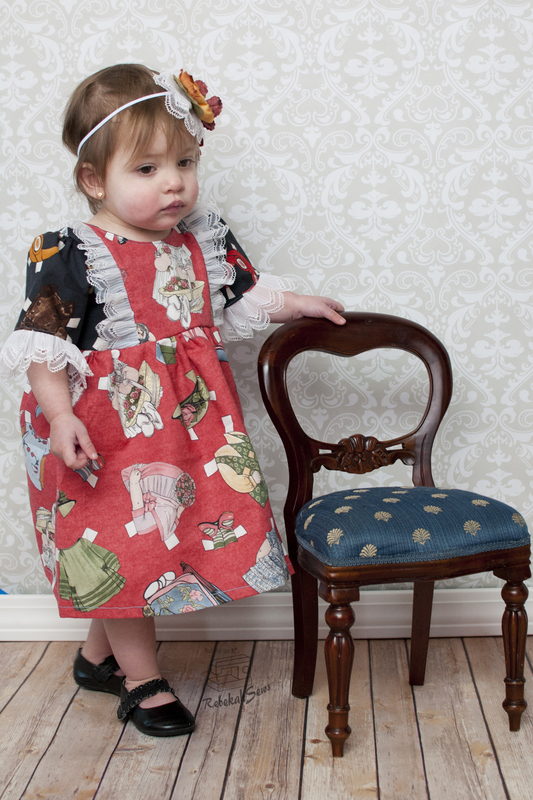 Head on over to the pattern shop to pick up your copy of the Bumblebee Dress. Then head on over to Trixie’s Fabrics and get some awesome fabric to make it with! Don’t forget to post what you made on both Raeanna’s and Trixie’s group as I would love to see! And they would too I’m sure! 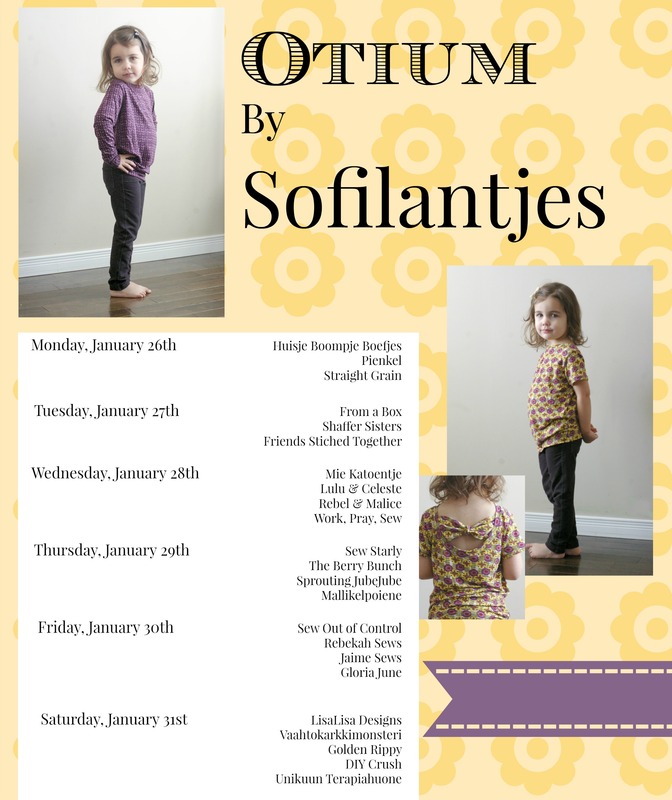 Bow-licious with the Otium by Sofilantjes! Who just loves blog tours? I know I do, especially when I am part of them! Today I couldn’t be more excited to be part of the Otium blog tour with Sofilantjes. The designer behind Sofilantjes is an awesome woman by the name of Annemieke. 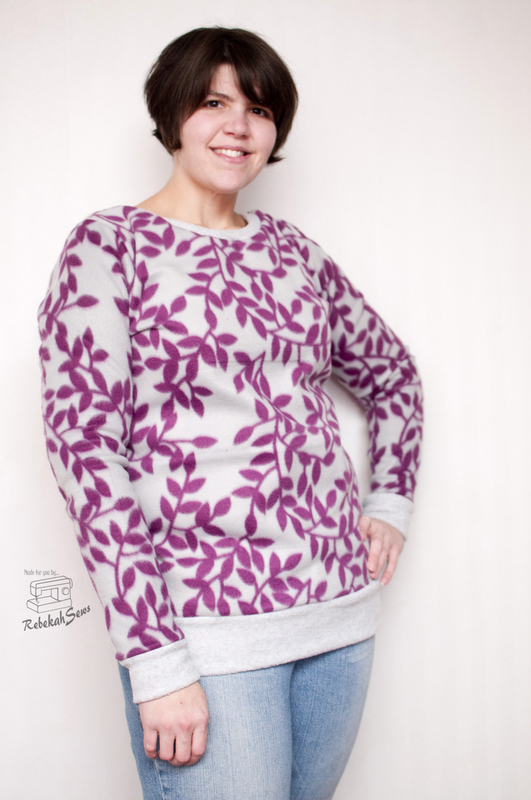 I have had the pleasure of testing and making many patterns by Annemieke and just love all her designs. Needless to say I jumped on the chance to be a part of her blog tour too!! Let’s take a look at the Otium pattern shall we? First of all, here’s a little lesson in language. Otium means ease in Latin. Yes, I Googled it. 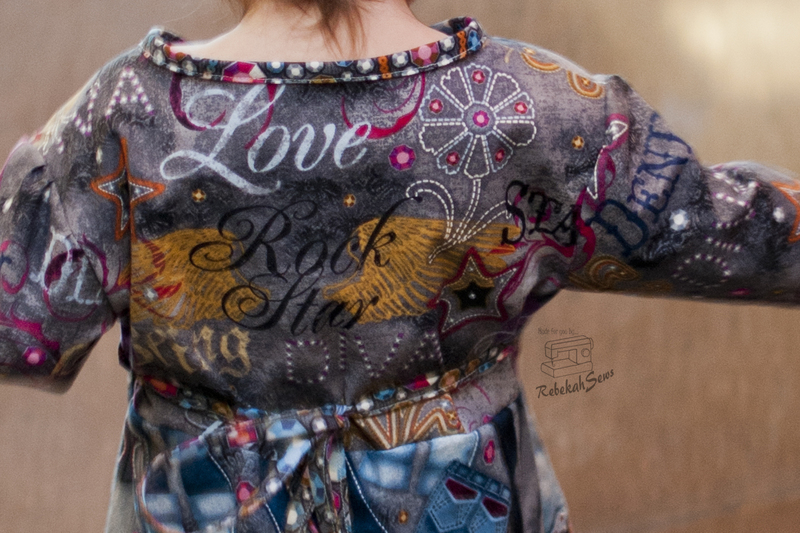 The name and meaning is quite fitting and perfect for this very comfy shirt pattern. Coming in sizes 12m-14yrs and women’s XS-XXXL this pattern is great for all the girls and women in our lives, including you! There are many options in both sizes as well. Options include 3 sleeve lengths (long, 3/4, and short) and 3 shirt options (diagonal pocket, low back with bow, or regular shirt). All are finished with cuffs on the sleeves and a waist band which means no hemming!! That is not to say you can’t hem it, but really why hem if you don’t have to? 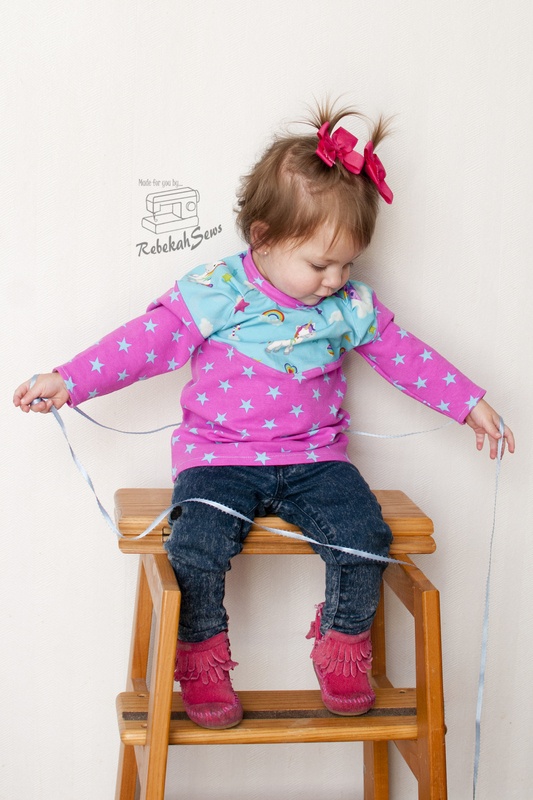 The tutorial walks you through each step accompanied by illustrations so even a beginner to knits can perfect this one. Yes, the ease in which it is made and the ease that you feel in wearing it…yes, the name says it all. For this tour I not only had the pleasure of making another shirt for my baby girl but also to do a little self care sewing for myself! First let’s take a look at baby girls top. For hers I made the size 12mo with the low bow back. The fit is great. Nice and relaxing. For my top I also made the low bow back but I was able to fit it so it fits me perfectly. 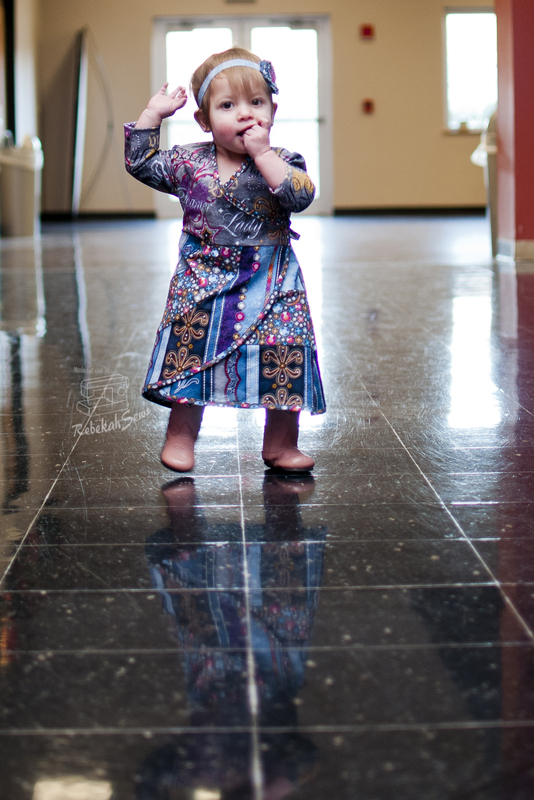 Annemieke knows all women are beautiful in all different shapes and sizes. In the pattern it shows how to fit the top to fit all of our more curvy areas where ever they may be. Using her instructions I was able to make my top to fit my size M bust with my size L hips. The fit is perfect!! I used fleece on both tops and it worked out beautifully. I was even able to use it for the collar with just a little extra length added to the collar measurement per the suggestion from the tutorial as well! This pattern really sets you up for success! 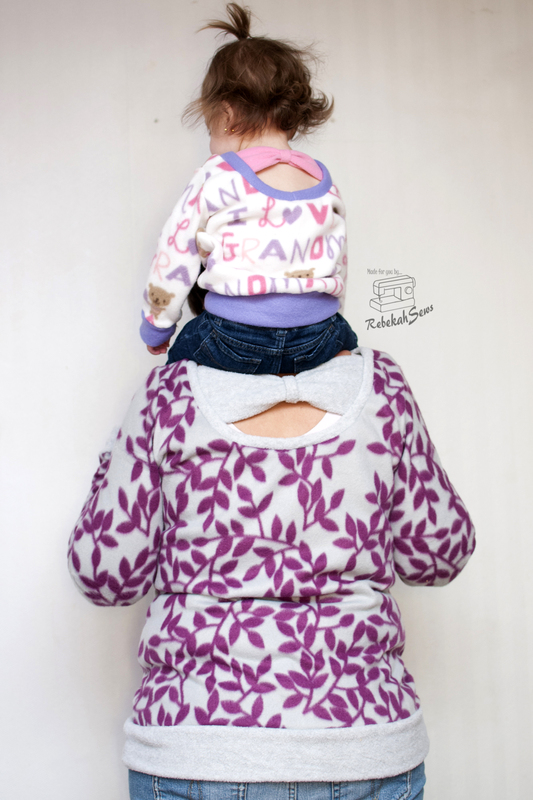 You may not be able to see, but baby’s girls fabric says “I love Grandma”. 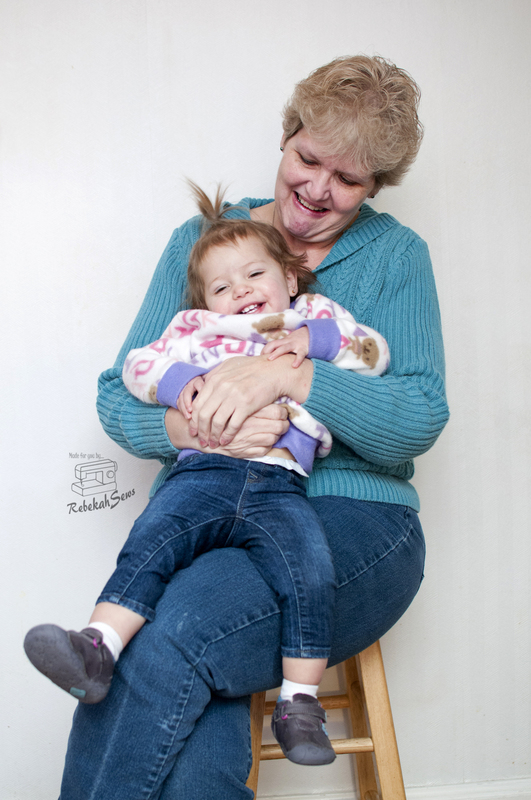 Perfect opportunity to take some cute pics of her and Grammy!! Ready to make your own? Even if you are new to knits, you can make this one. And don’t worry, if you need a little help or someone to hold your hand there is a Sofilantjes Sew and Show Group to help you out! 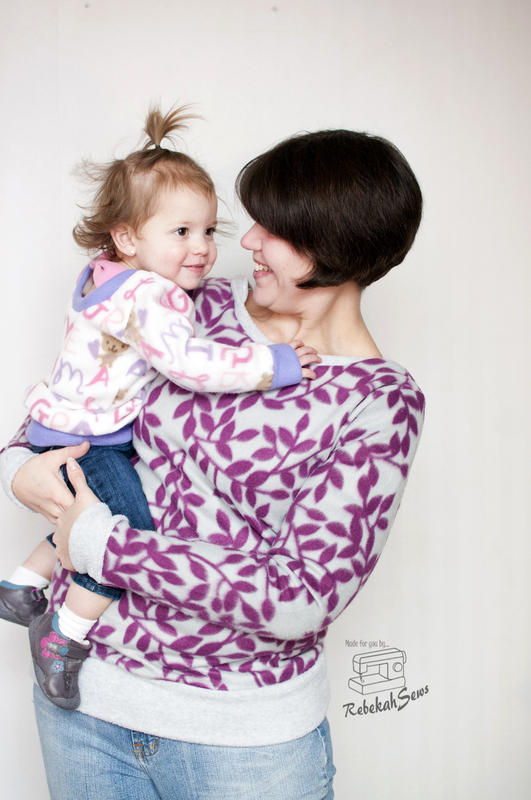 Now head on over to the website and pick up your copy of the girls or women’s pattern which are both 20% off. Or get both in the bundle pack for 30% off! Don’t forget to enter a Rafflecopter giveaway too for your chance to win 11 patterns from some awesome sponsors of this tour!! 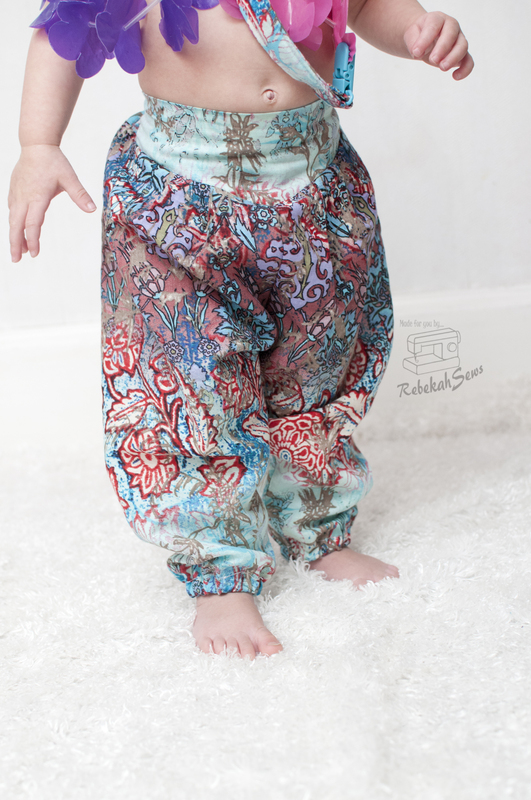 Bundle Up with EYMM’s Freestyle Harem Pants! It’s that time again! Time to Bundle Up! No I’m not talking about staying warm for cold weather, although with the current snow storm here in New England we are doing just that. I’m talking about that time of the year when you can get 11 new patterns at a fraction of the cost; and the more you buy, the more you save. I’m sure you know the theme by now. But in case you don’t, this sale’s theme is for the girls! I absolutely love all the patterns and now own them all. These will certainly help keep my girl stylish for awhile. 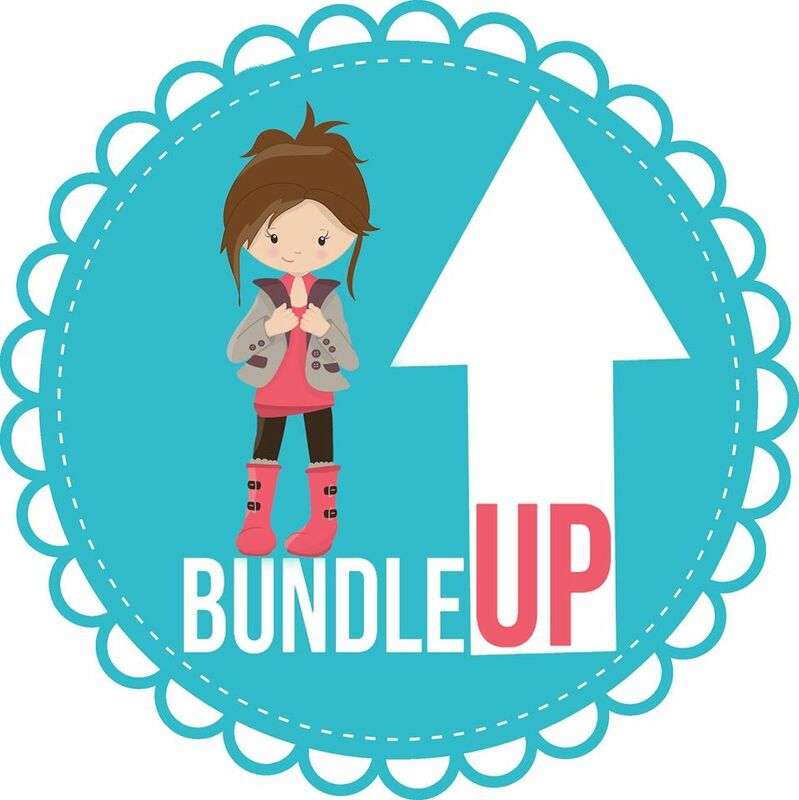 Today we are taking a closer look at one pattern on the Bundle Up tour! 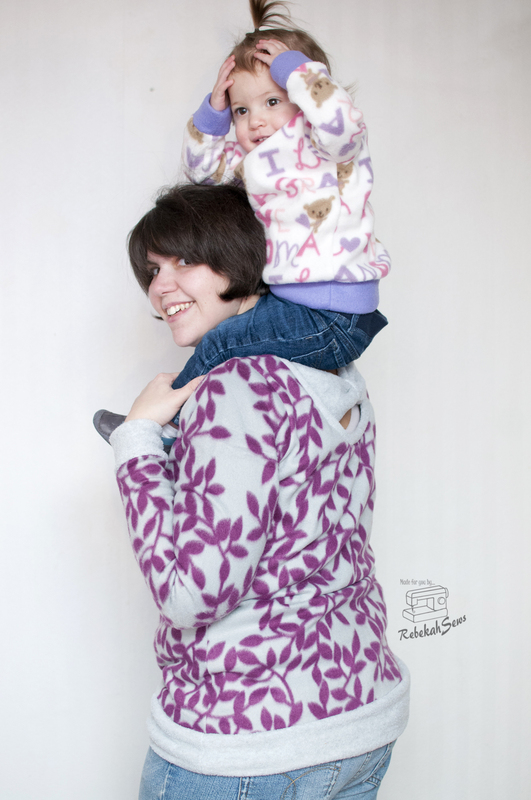 The Freestyle by Everything Your Mama Made (EYMM) is a fun and comfy pattern for girls, and boys too! It comes in sizes NB-18 as well as 18″ doll. There are many options with this pattern such as 3 lengths (shorts, capris, and pants), 2 waistbands (straight or pointed), and 3 hem options (plain, cuff, or elastic). You could make many different looks with this one! The back has elastic for fit and comfort. The hardest part of the pattern is making the pleats, which isn’t hard at all! I used a very cool woven fabric I have been hoarding for awhile waiting for the perfect pattern. Well this was it! I just knew it as soon as I saw the pattern. I couldn’t be happier with the results. For baby girl I made the 12-18mo with the pointed waistband and elastic hem. The fit is great with room to grow. 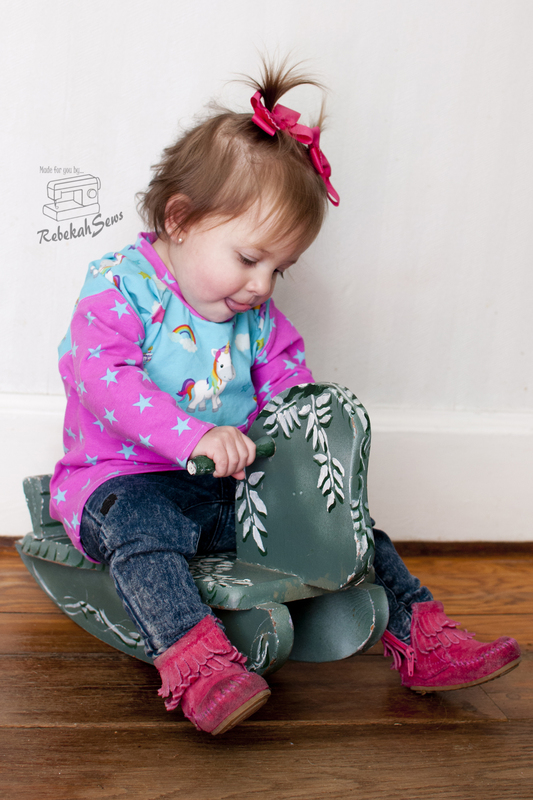 She looks absolutely adorable (yes, I’m a little biased) and comfy in these. 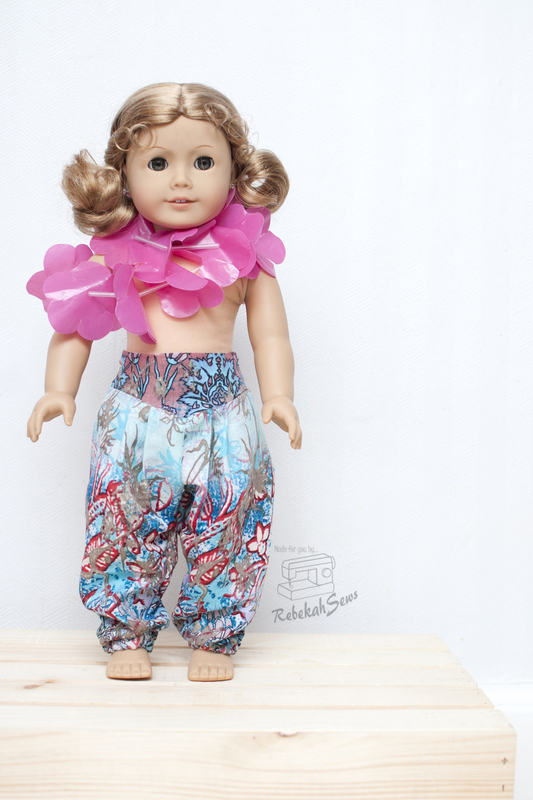 I also made matching doll pants too! Don’t they make such a cute pair? Like I said before, this is just one amazing pattern in the Bundle Up Sale! You have to check out all the others. Trust me, you won’t be disappointed. 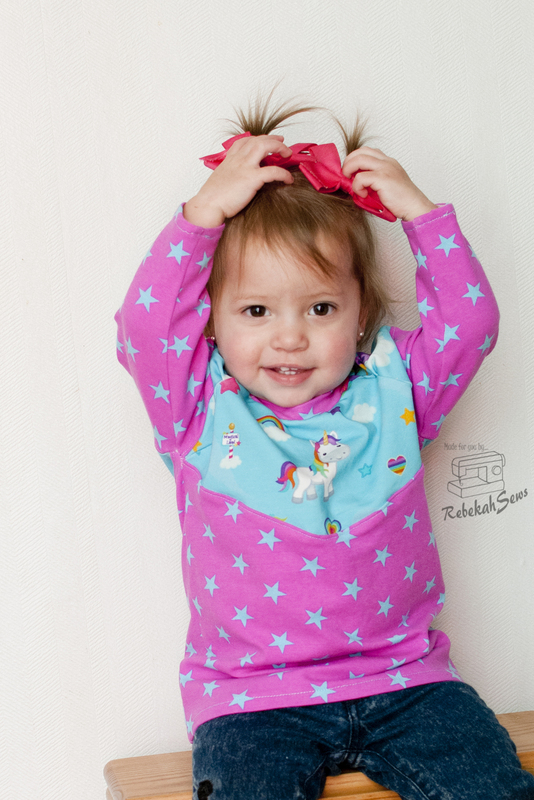 Make sure you also check out the Pattern Revolution blog for all the giveaways during the Bundle Up sale. There are some amazing prizes you don’t want to miss. While you are on your cyber travel checking out those amazing prizes, don’t forget to also stop by these other blogs and check out the stunning outfits made from these new patterns! 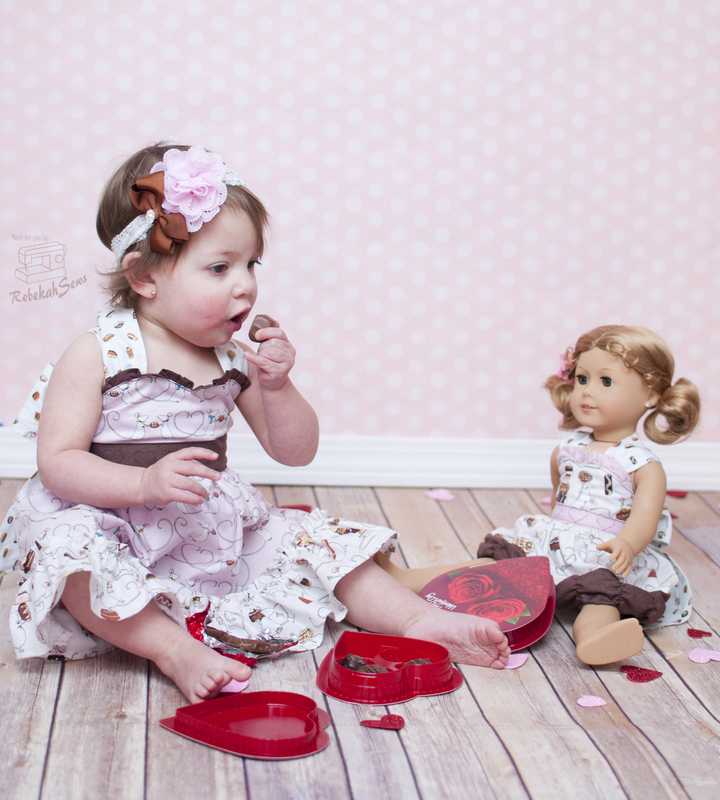 It’s a Chocoholic Valentine with Mandy K Designs! Valentine’s Day is just less than 3 weeks away! Are you ready? 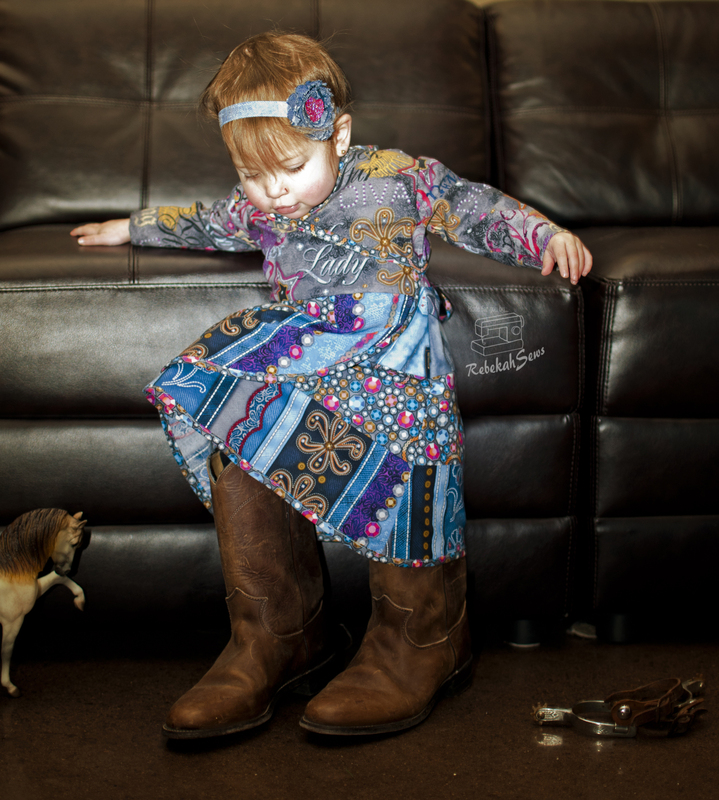 If you aren’t and haven’t decided what dress to make your little one, then I am here to help you out! 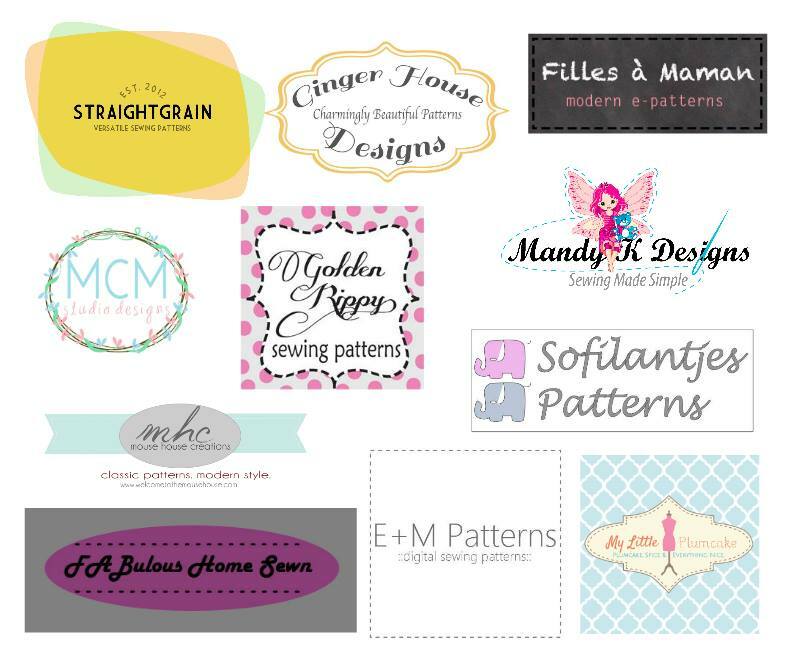 Have you heard of Mandy K Designs? Well if you haven’t, let me introduce you to a newer yet awesome designer. 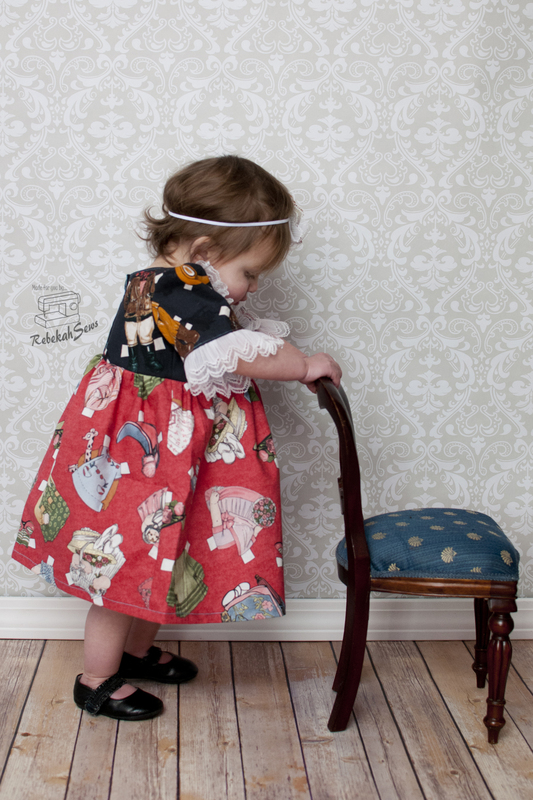 She has created patterns for girls that are fun, cute, and classic, yet stylish all at the same time. Don’t just take my word for it; I think this dress speaks for itself! This is the XOXO dress (the name! Love it). It is the perfect dress for Valentine’s and any occasion really. Coming in sizes 12m-14yrs, this will fit your girl for many years. Did I also mention that it comes with the 18″ doll pattern included? Yes! It does! The sweetheart bodice is fully lined, so no itchy seams here. The ruffle on the bodice is optional, but I love how it adds to the girliness. The wide straps lace up in the back in a corset-like feel. The skirt is accented with two different kinds of ruffles. The first kind is the more traditional overlay ruffle, which can then be accented with ribbon or rick rack. The second is the more stunning and regal ruched ruffle. This is a little more time consuming but well worth it! The tutorial is well written and accompanied by clear photos. I would rate this pattern as great for an experienced beginner, but also perfect for the advanced seamstress as well due to all the options you can have with sewing this beauty. I must say I love the tip of hand sewing the bodice lining down prior to topstitching to make it easier and for a more finished look. Genius! For my girl’s Valentine dress I decided to have a bit of fun. 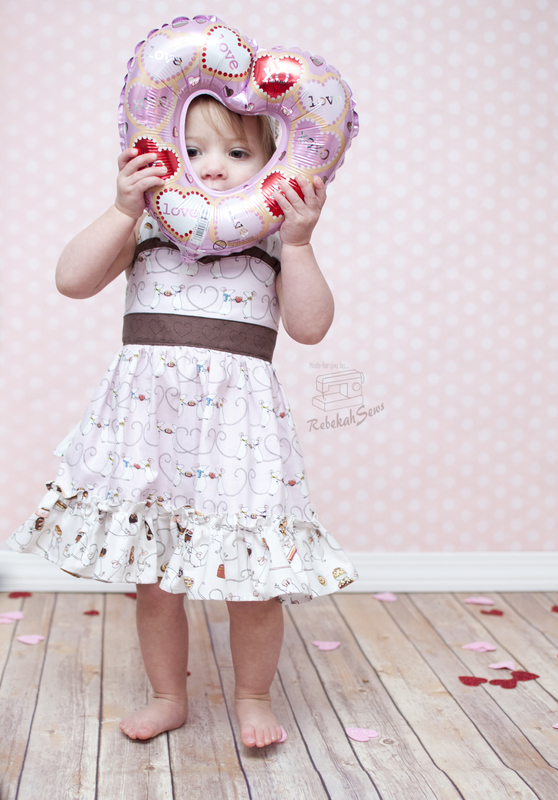 I wanted to steer away from the more traditional looks of Valentine’s Day (hearts, roses, etc.) and feature a more uncommon theme. Can you guess it?? Chocolate!!!! 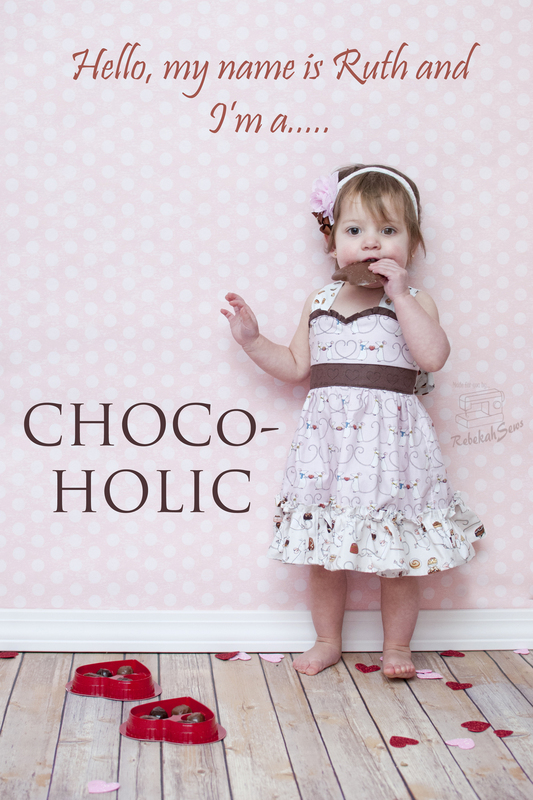 When I found this fabric line called Chocoholics I knew it was perfect for my chocoholic girl. She can thank her Grammy for that. Grammy was the first one to introduce her to chocolate and she can’t get enough ever since. Bad Grammy!! LOL. I digress; back to the dresses now. For my girl I made her a size 12m and the fit is AMAZING!!! The corset back certainly helps for fit too as you can tighten or loosen as much or little as you want. As you can see I chose the overlay ruffle for her. I also made my very first doll dress! The same Chocolate Grammy gave my girl an American Girl doll for Christmas (good Grammy!) and it is time I started sewing for her too. Again the fit is great on the doll too! Did you notice the ruched ruffle? I love it. I would love to try it using the shirring method next time instead of 1/4″ elastic as I think that will help it curl a little less so you can see more of it, just because I love it so! 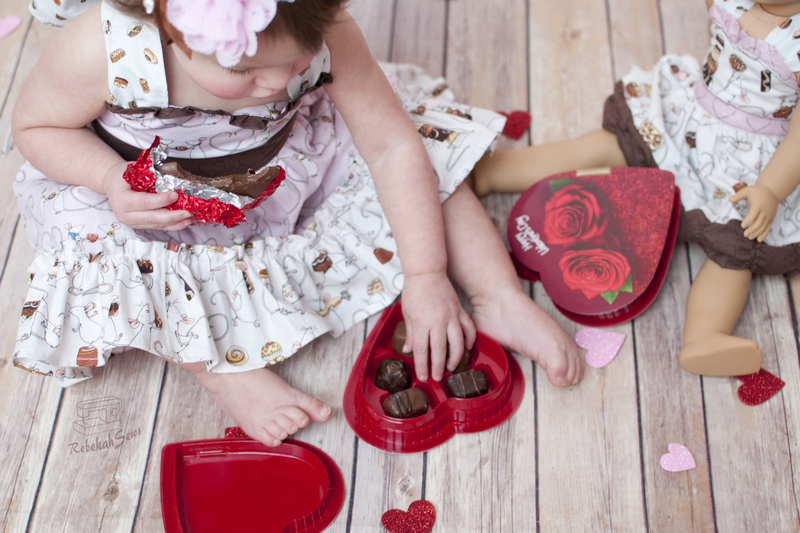 Sharing her Chocolate…It must be love! 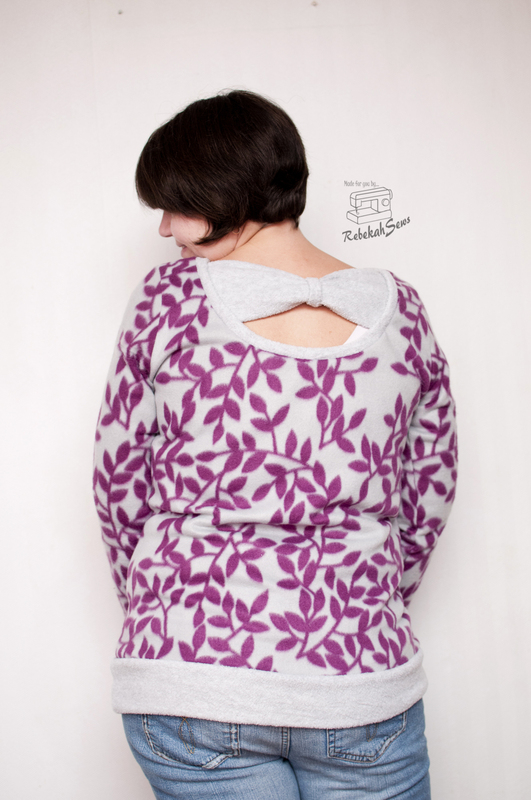 I am now officially a Mandy K Designs fan and certainly look forward to sewing more of her patterns. 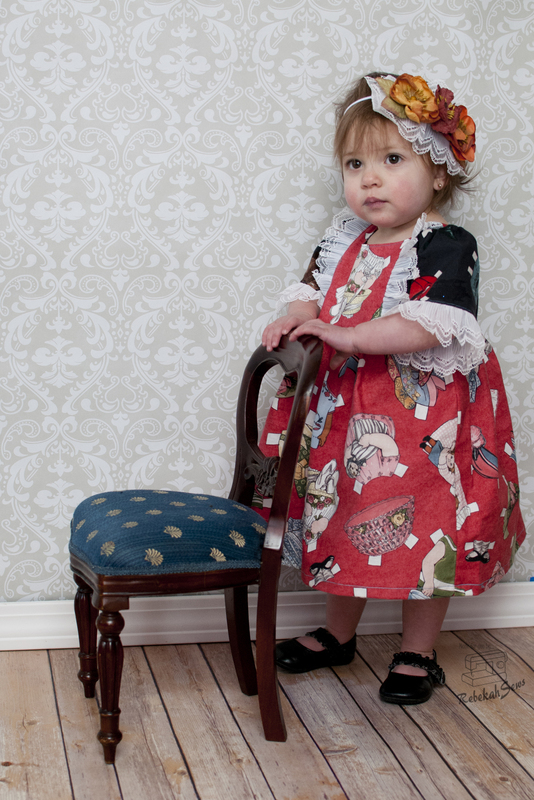 I plan on reviewing the English Rose dress next month when I sew it up for baby girl’s Easter dress. After that I think the next one would have to be the Happy Days dress as it will be perfect for spring. Then after that…sorry, digressing again; but seriously her patterns are quite addicting! Now if you need a little encouragement to get your girl’s Valentine’s dress done then I have the perfect solution for you! 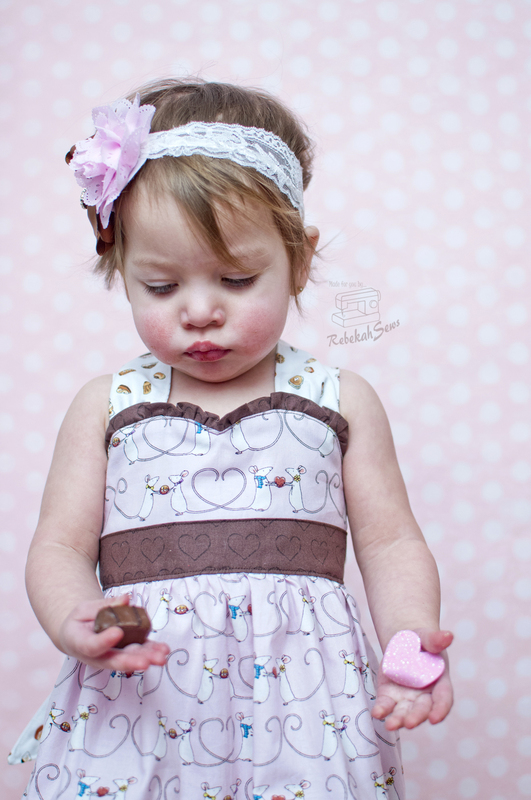 From Feb 2nd to Feb. 6th Mandy K Designs is putting on a Sew-a-long over in her group. Now is the perfect time to go join the pattern group and then pick up the pattern on sale for $6.50!! 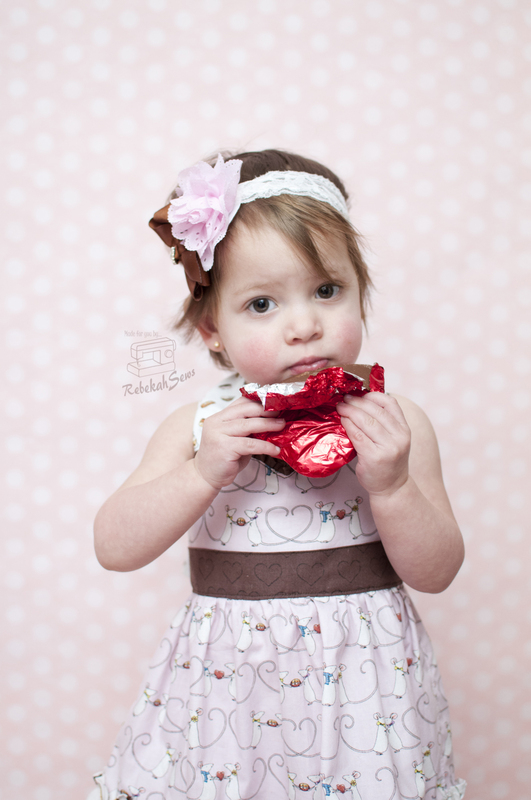 I can’t wait to see all your little Valentines XOXOs! 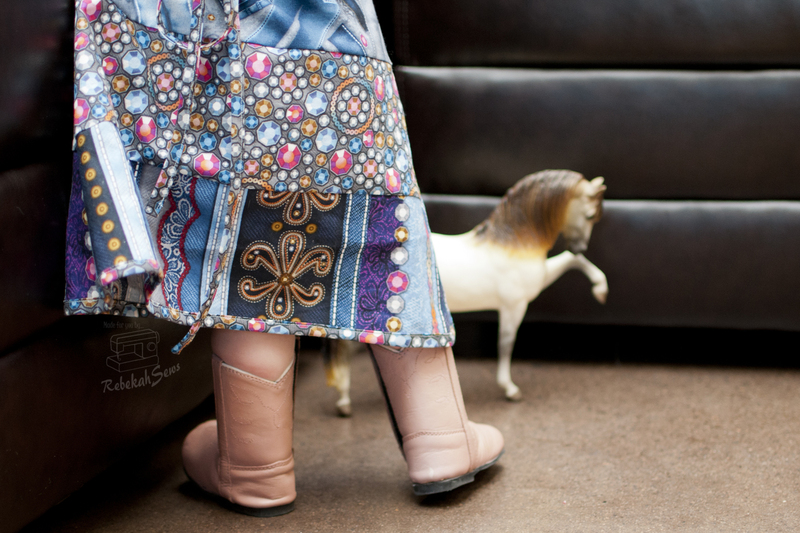 A Little Western Diva with Sofilantjes! Hope everyone is having a great New Year so far! I was meaning to post something on Christmas to wish everyone a Happy Holiday and also on New Year’s Day as well, however the start of this year has thrown me for a loop. With my day job taking more time than previously and sickness taking over the house, the days just got away from me. So here I am now, hoping everyone had a wonderful holiday season! I know I am glad to start getting back to normal. That being said I am hoping to accomplish more off my sewing list this year. That post will come later. Right now I have to show you some more amazing fabric and a just as amazing pattern! 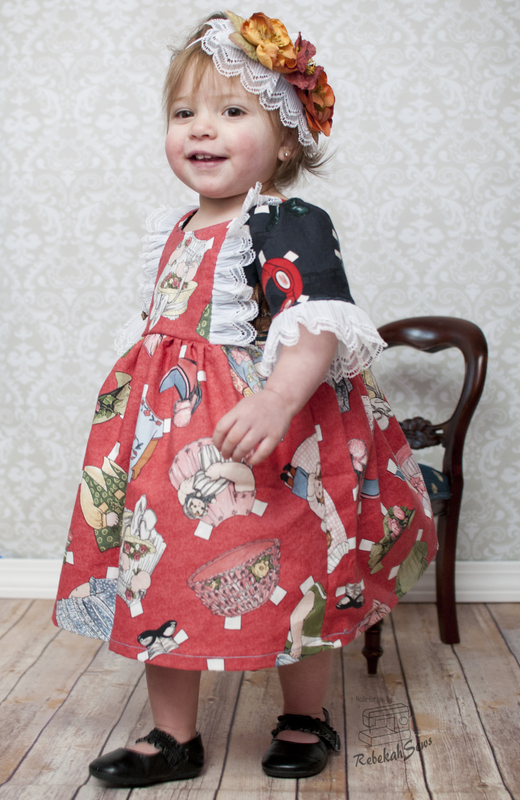 Tonight we are looking at a great girl’s pattern by Sofilantjes. 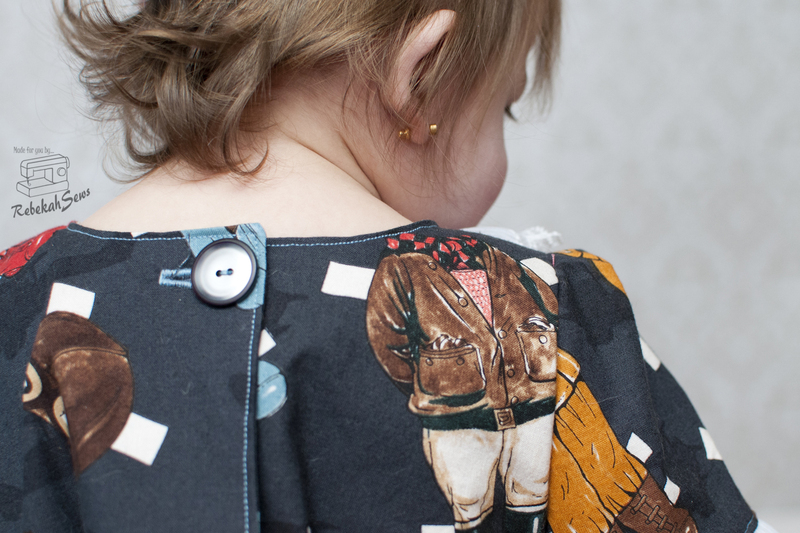 Sofilantjes is a newer designer with big things in store for the sewing community. 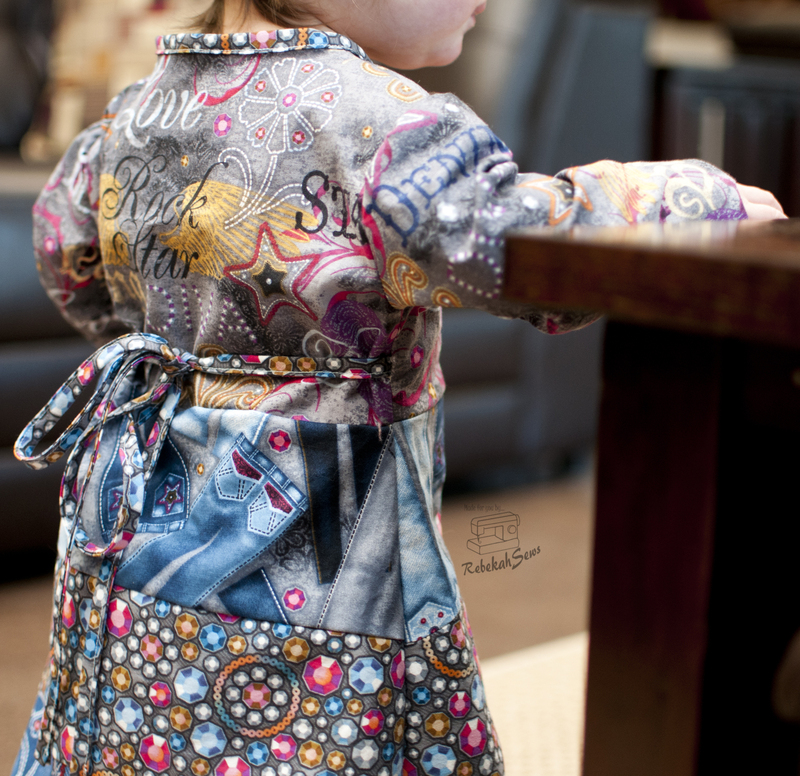 AnneMeike continues to design new and trendy patterns for the whole family. I have tested several of her patterns and just love them, so trust me when I say you will love them too. Today we are looking at the Iridis wrap dress. 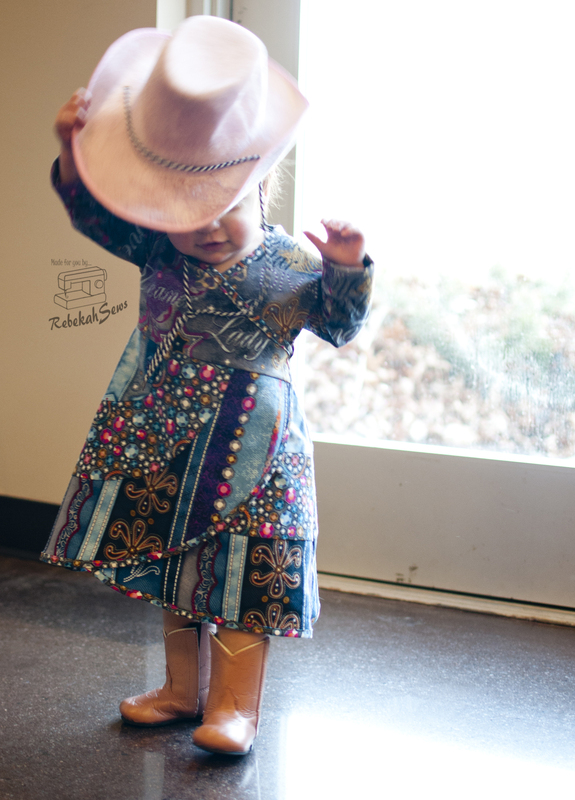 This dress is so cute, and versatile as well! 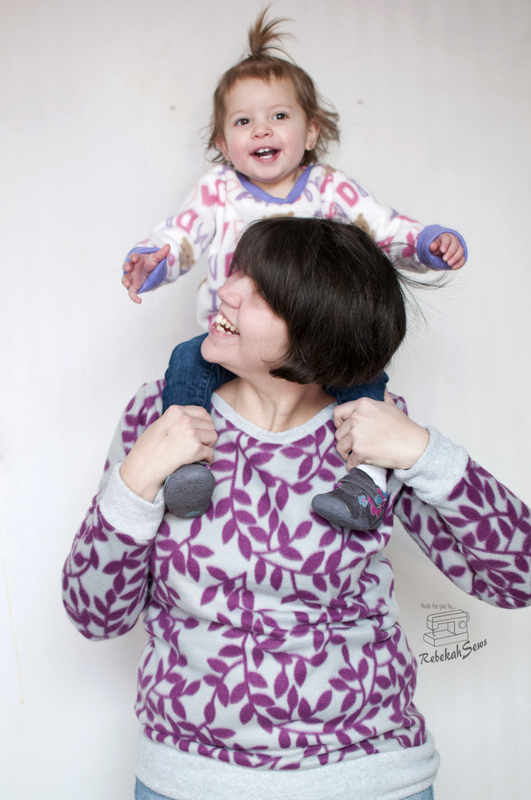 It comes in sizes 12m-14y and can be made of woven or knit. The woven version gives you nice clean lines and is finished with bias tape for the hem. The knit version is a bit more fun and frilly with a tiered skirt that is finished with a rolled lettuce hem. With two sleeve lengths (short and long) this dress can also be used for any season! I know my girl will be getting one for summer this year! I did the woven version in a size 12mo for my girl. Now my peanut is at the lower end of a size 12mo. Her chest is 18.5 inches and she is 29 1/4″ tall. Yup, definitely a peanut! Even though this is a tad big on her I love the fit. This dress being a real wrap dress also gives it a little more ability to be adjustable so it will fit her now and later! 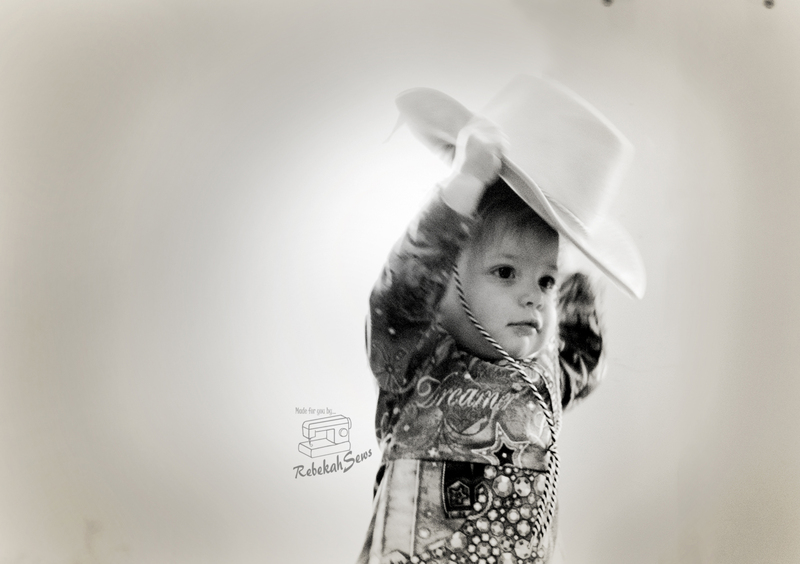 The tutorial features illustrations and photos which give it clarity. However if you get stuck, just head on over to the Facebook group for help! It is a fast sew once it’s cut out. Yes, there are quite a few pages to print and cut- 39 pages for the woven version and 50 pages for the knit version. Those are needed though for that unique skirt. To make printing and taping a bit easier though, this pattern offers a layer feature so you only have to print the size you need! How is that for convenience? I think a confident-advanced beginner could sew this pattern up with amazing results! What do you think of that fabric? Amazing right? I am just in love with it! When Trixie’s Fabric posted photos of it in her group I just knew I had to have it. I actually got enough to make another outfit out of it too! This is the Diamonds & Denim collection which includes 6 fabrics. I used 4 of the collection in this outfit! Now if you are wondering where to get this fabric or other great fabrics then you have come to the right place. Trixie’s Fabrics are a wonderful fabric group hosted by Trixie. She also has an Etsy shop too! I am a repeat customer with Trixie as she really goes above and beyond to give you great customer service, not to mention being dedicated to providing you with awesome knit and woven fabrics! Head on over to the group and check it out. I promise it will be worth the trip. However don’t blame me if you find yourself adding to your fabric stash! 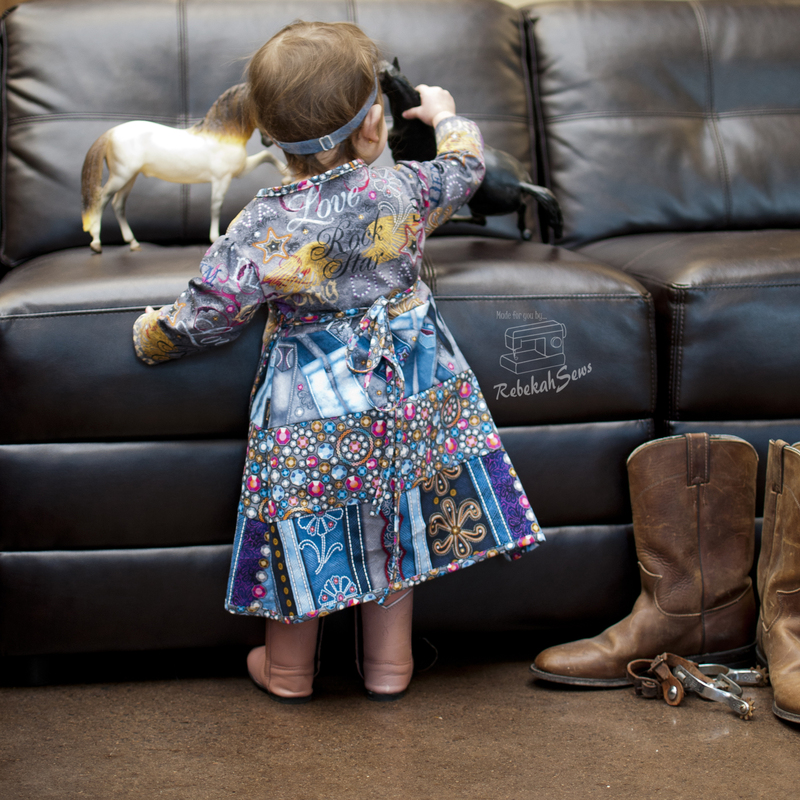 You have a little bit to grow till you fit in mama’s boots…take your time sweet girl! All Tucked in With More Holiday Pjs with EYMM!! 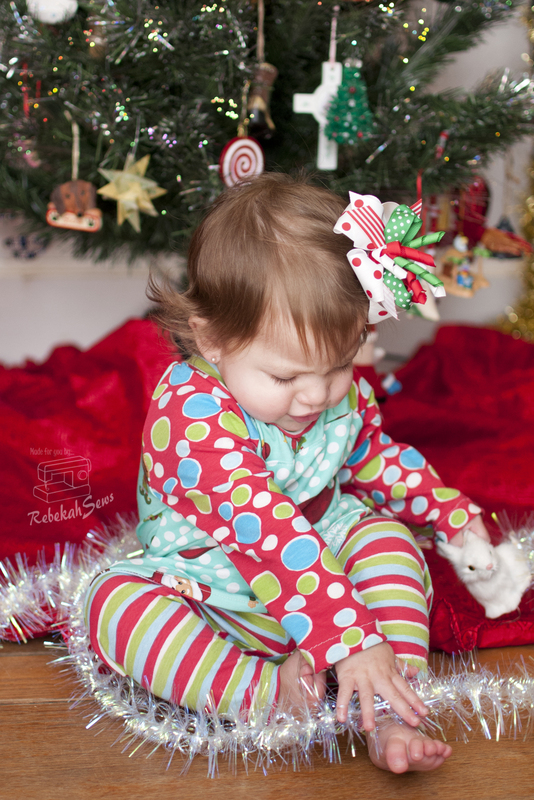 Christmas jammies. 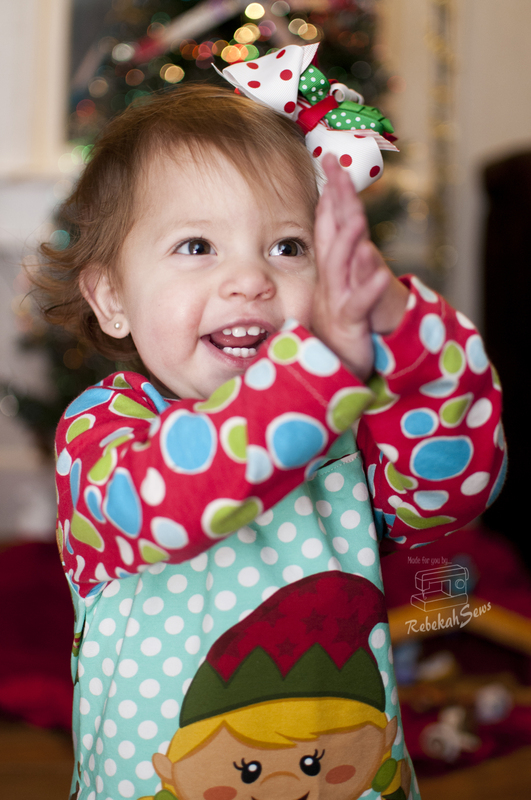 Now who doesn’t love Christmas jammies? You can go anywhere from plain to fancy with jammies and they all have the same goal: sweet dreams. 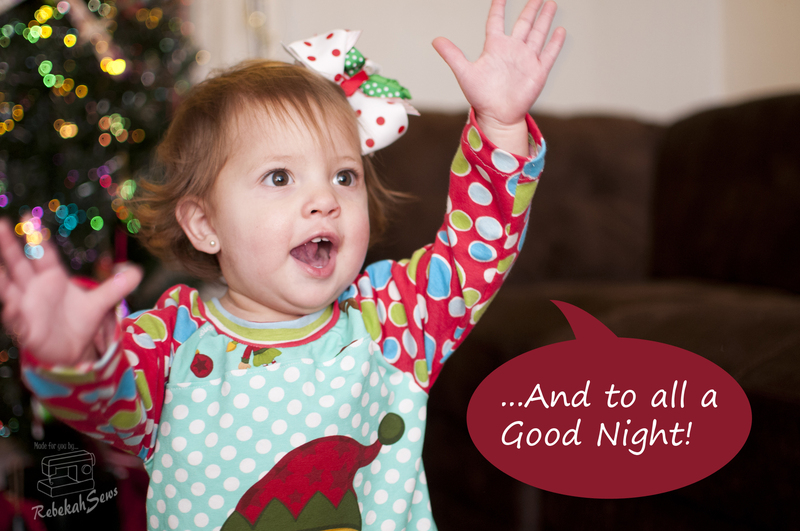 Yes, there is nothing sweeter than seeing children sleeping in their Christmas jammies. Today I’m part of the All Tucked In tour with Everything Your Mama Made. Can you guess the pattern? Yes, the Riley Nightgown and Sleep Shirt. 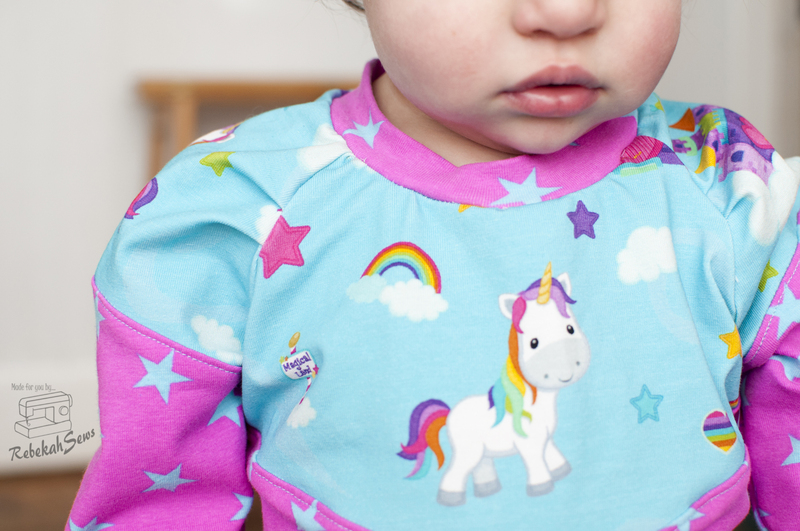 When the Riley Nightgown and Sleep Shirt was released a while back I had the pleasure of testing it (that’s baby girl sleeping up in the corner of the banner!). 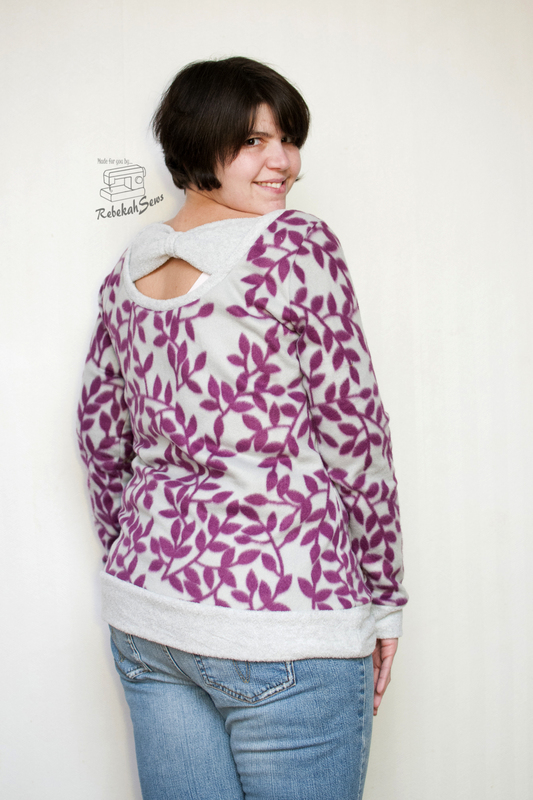 As with all of Kymy’s patterns it is a fast sew that is super comfy! Riley’s ranges in sizes NB to 18tween. 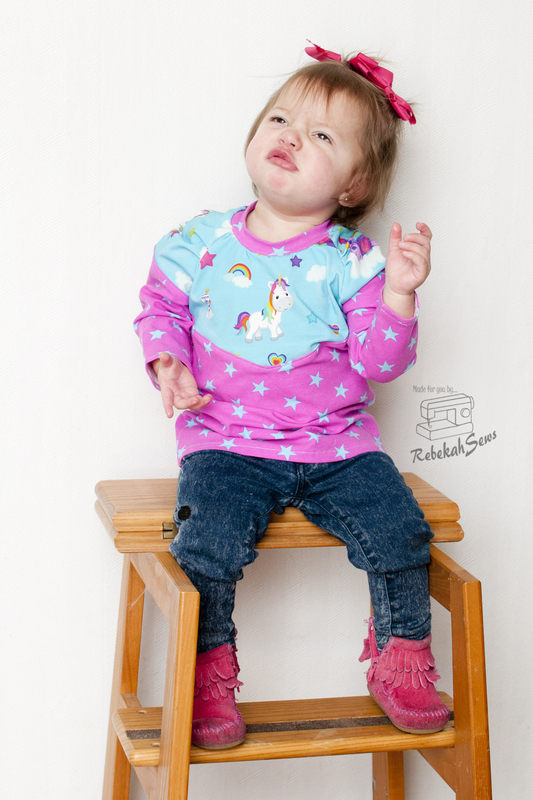 There is also an adult version too called Callie’s which ranges in sizes XS-5X! This is definitely a pattern for the whole family! As you may have guessed from the name of the pattern there are both nightgown and night shirt lengths. It also features a raglan sleeve and facing for the bottom hem. Due to the roominess of the pattern it can last awhile too! I had tested the size 3-6months if memory serves me correctly, and baby girl still fits into it! This time I made the 12-18months and it is super comfy! Now I paired baby girls night shirt (I know it looks like the gown option but it is the shirt option. Baby girl is just short!) with the Jocelyn leggings for a complete pj set! When baby girl sleeps she wiggles and squirms and often times sticks her bottom up in the air which leaves her legs uncovered and cold. Therefore I like to make sure she stays nice and warm and what better solution than adding the leggings to match? Ranging in sizes NB-18 tween you again get a huge amount of sizes! There is also a women’s version too! One thing I love about this pattern is the yoga waistband. No elastic here!! 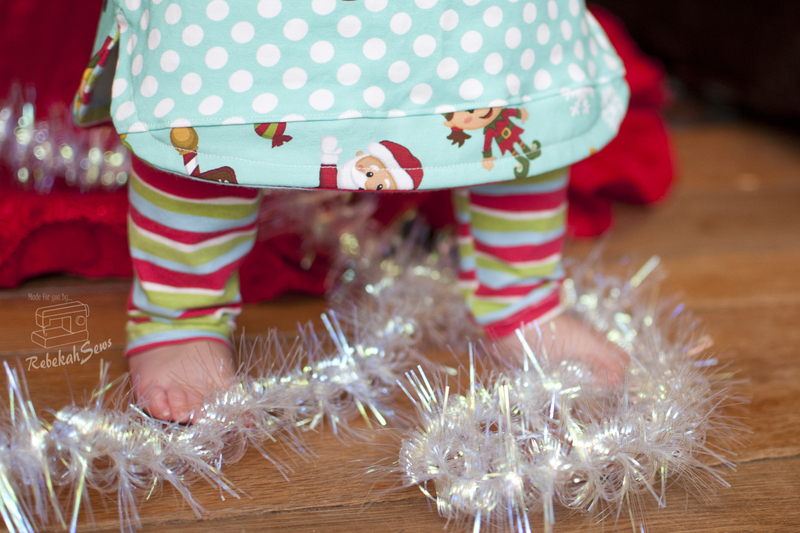 Christmas jammies aren’t perfect without the perfect fabric! I need to say a huge thank you to Trixie’s Fabrics for supplying me with this amazing fabric! 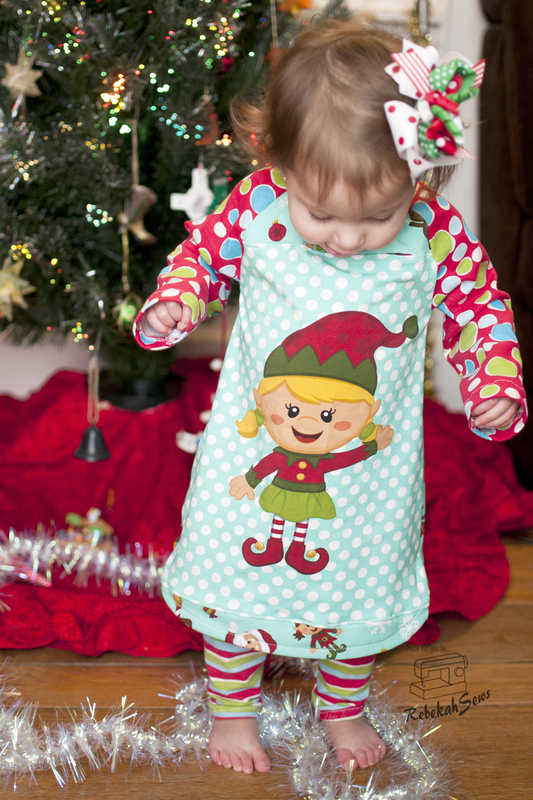 The Elf girl panel in front as well as the Santa and Friends print in back is an amazing organic Euro knit. The accent fabrics were a perfect compliment to the Euro knits too. I love quality knits, and these are amazing!!! If you want some of your own quality knits and great customer service you need to head on over to her Facebook group or Etsy store! 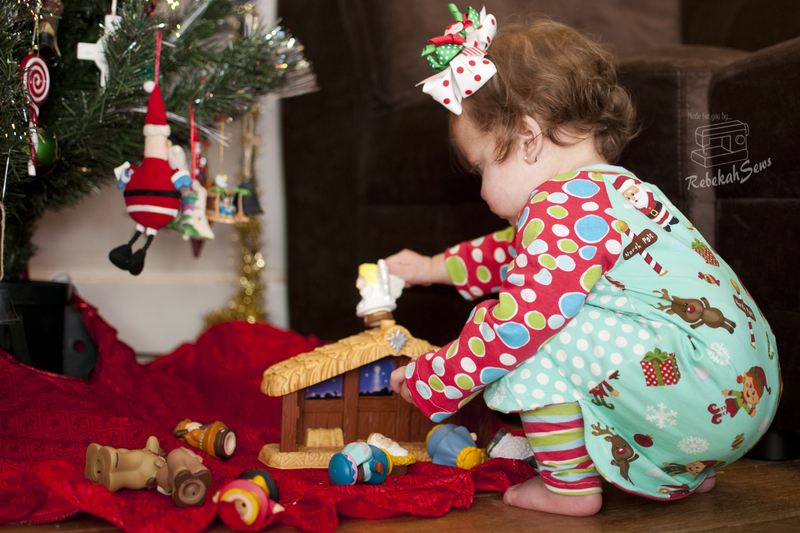 Ready to make your own Christmas jammies?? Head on over to the EYMM store and buy your copy of Riley’s Nightgown and Sleep Shirt. Use code SNUGASABUG for 30% off till December 11th too! Don’t forget to check out all her amazing patterns while you are there. My little one is all tucked in for the holidays, is yours? 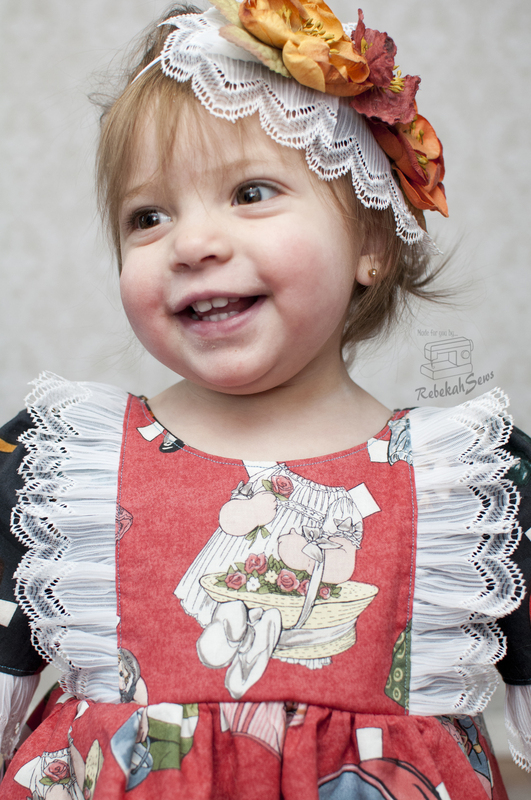 Yummy Fabrics + Great pattern = Sewing High! 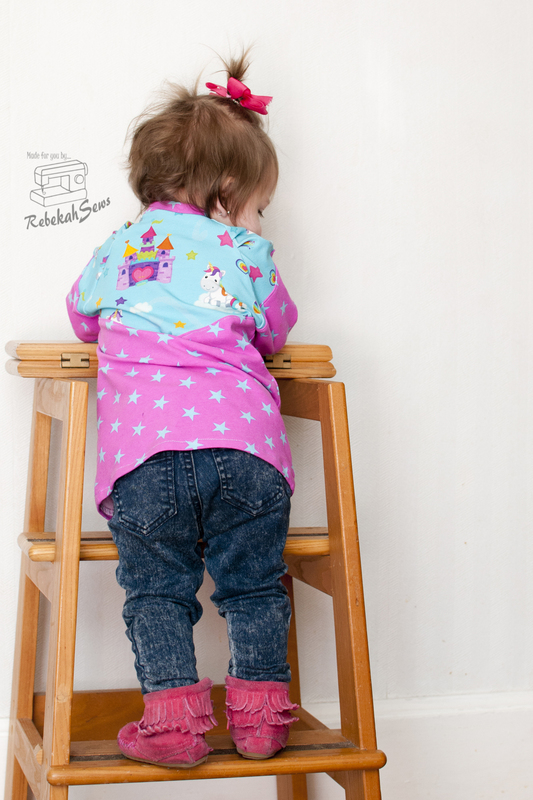 Do you ever have that moment when your fabric inspires what pattern you use? I did with this project! Even better? My envision came out perfect with this one and I couldn’t be happier! 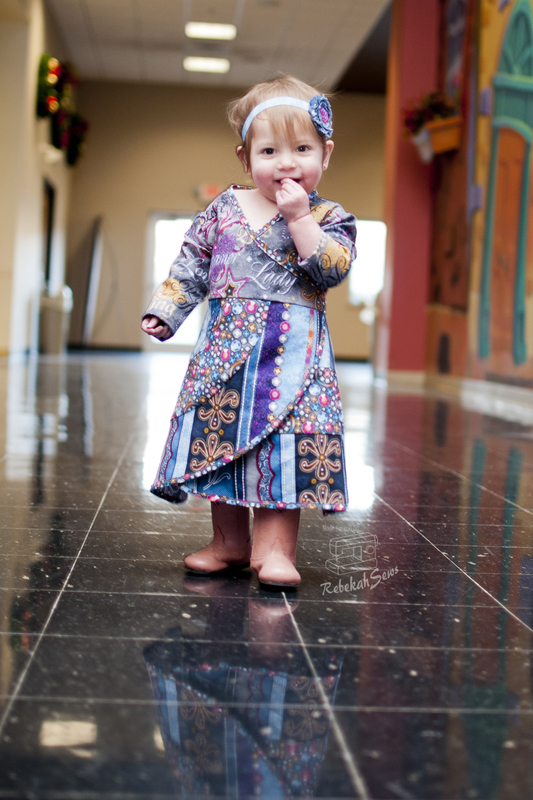 Between the amazing fabrics and a great pattern, my baby girl is really styling. She is a bright and shining star in the dreary cold of winter! Aren’t the fabrics so beautiful? Let me let you in on a little secret with these fabrics. I know you are all probably wondering where I got them and if they are from any of the more main stream vendors. Well they aren’t! Yes, I could have bought them from a more mainstream shop but I just love the customer service at Trixie’s Fabrics. I knew I wanted to work with the unicorns but wasn’t sure on which colorway or which coordinate. When I messaged Trixie through Facebook, she has a wonderful group for her fabrics, Trixie took photos of the fabrics together so I could see what they looked like. When I was still undecided she helped me even further but letting me know which were better matches than you could see in a photo! 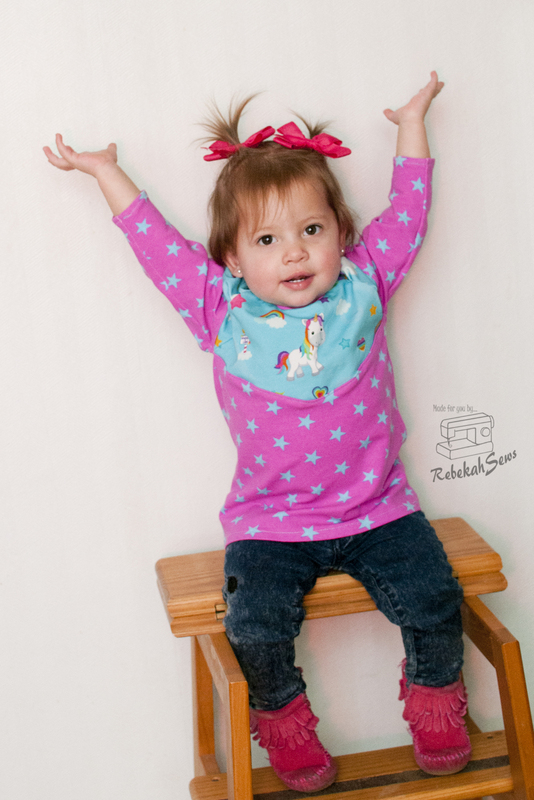 With her help, I decided on Blue Stars on Pink Cotton Lycra Jersey and a very yummy Organic Euro Unicorn Knit in the Aqua colorway. If it wasn’t for this I would have picked an entire different combo and not gotten this amazing end result! If you like this kind of service and great fabrics I highly encourage you to head over to the group and join! If you just want to shop she also has an Etsy store! Before picking the perfect fabric combo I knew that the unicorns and stars had to be used on a pattern I have had for awhile but still hadn’t made. I have admired Shwin & Shwin patterns for awhile and have a few of them. They are modern too! I won’t keep you in suspense any longer. 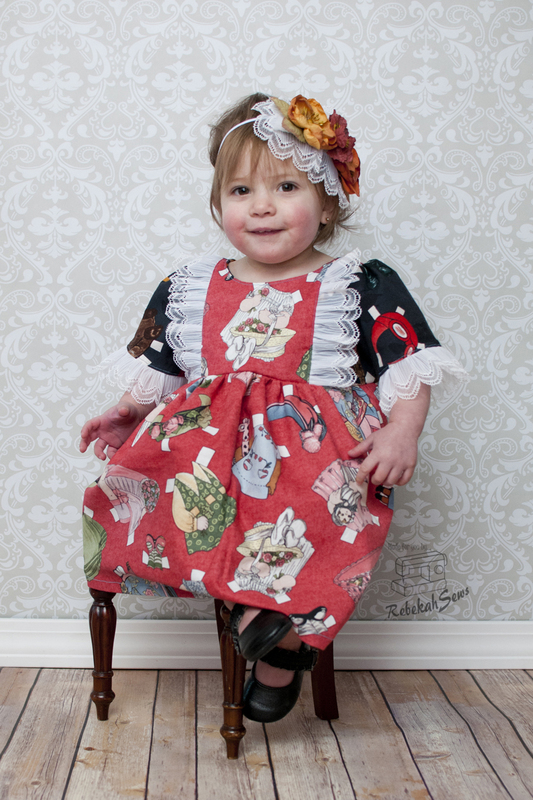 The pattern I used was the Lucille Top by Shwin & Shwin. I just love that this is designed for color blocking, the angled look, as well as the pleats that create a puffy shoulder. 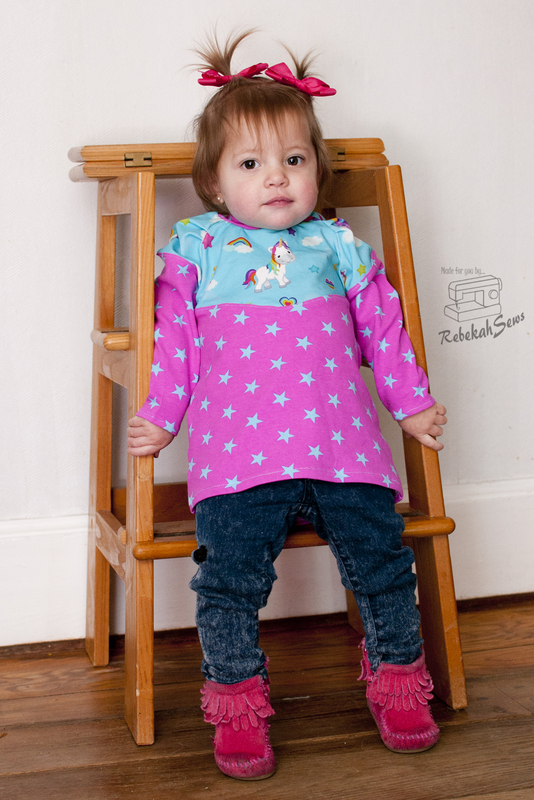 This raglan shirt comes in sizes 12-18mo to 8yrs. The overall fit is great. My girl is short at only a 7% for her age so the top is more of a tunic on her. That is fine by me as I love me some skinny jeans and leggings with almost everything. Another feature this pattern comes with is a cuff option for the sleeves. I had originally added the cuffs but then cut them off. After attaching them and trying it on my girl I found the cuffs made the sleeves way to long which in turn made it lose the shape at the shoulder. They also were a little on the tight side. I much prefer it without the cuffs for sure. I will try the cuffs again in the future but definitely cut some of the sleeve off so I don’t lose the shoulder shape. 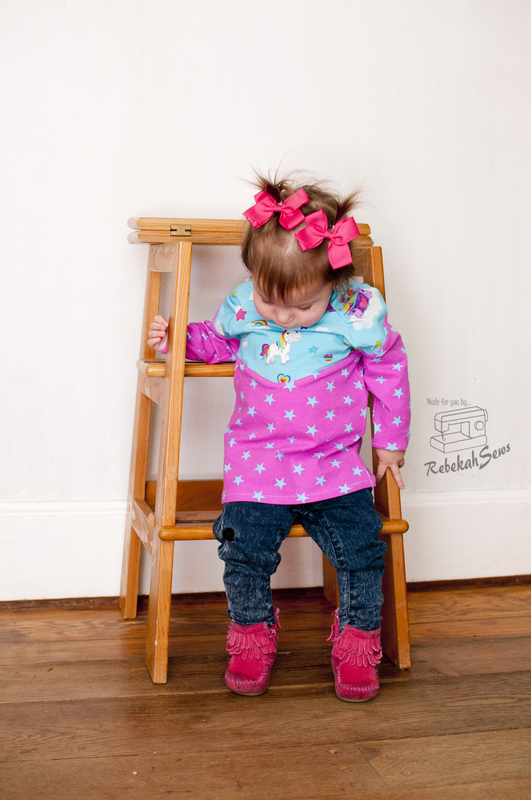 Overall this pattern is very easy and cute. You do have to pay attention when pleating the shoulders so they all go the same way, but even with that it is a quick sew. I was able to sew mine up in about 1.5hrs and that is with some fussy cutting of the unicorn fabric so I could feature a unicorn on each piece. Don’t you just love when a project comes out just as you had imagined? I sure do. That feeling of satisfaction is unlike any other. One of the greatest highs of sewing! So head on over to Trixie’s Fabrics and snag some fabric that inspires you and create a look for someone you love (which can include yourself) for your own sewing high! Happy sewing!